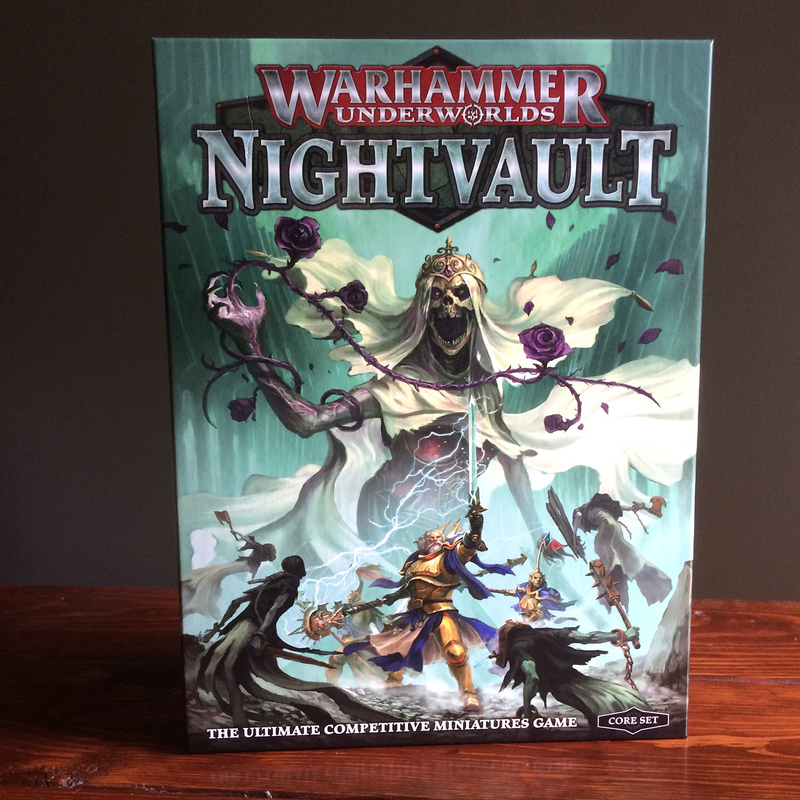 Shadespire made a huge impact when it launched, and now a year later we get the next installment in it, Nightvault! So what does this box include and how does it interact with the game as it already is? First things first, there's a lot of overlap here with Shadespire, which I already reviewed last year here, so some things I'm not going to repeat. It contains all of the rules for the full game, two boards, two warbands, and all of the dice and tokens you need. 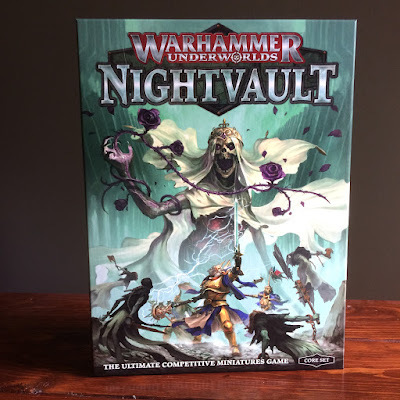 So, if you're jumping into Warhammer Underworlds for the first time, you can just pick up Nightvault and you'll be fine. I don't know if they're going to discontinue the Shadespire box or not though, since that still has some cards and boards unique to it. If you already own Shadespire, you'll want to pick this up too, even if you don't want either of the warbands. It has some new rules and tokens that you can't get outside of this box, including the two new boards and some of the tokens. The two new boards have some pretty cool looking artwork on them, and come with a couple of lethal hexes on them, just like the last board expansion. I'll go over these a bit in the rules section. So, what's different in the rules. To be honest here, I don't play nearly enough or recently to catch any minor changes that may have happened, so please forgive me if I miss a few things. I did notice that the FAQ to roll offs is now in the rules. Beyond that there are two major additions to the game; magic and scatter. Magic is handled in a way fairly similar to a normal attack. Only certain character are wizards, and they will have a little icon and a number near their name that signifies this. The number is their power level, this determines how many dice they get to cast when attempting their spell. Some wizards have a spell on their card, just like with normal attacks, but most of them will be on a Gambit card. Gambit cards are what we used to call Ploy cards. Now Gambit cards can either be a ploy or a spell. To cast a spell you roll the number of dice denoted on your character's card, these are special dice that have new symbols on them, but it works the same as any other attack. You need to match the symbol on the spell's profile or get a critical for it to go off. Then the opponent can attempt to defend against it as normal. Some spells obviously have a longer range than most other things in the game. The effects of the spell will be on its card. Scatter is the other major addition. If something scatters it will say on the card. One example is a chain lightning spell. There is a special hex shaped template provided that has a symbol from the dice on each side of it. You place this down in front of where the scatter is starting from and roll the number of dice indicated on the scatter. This will vary per action. For example, if it says it scatters 3 dice, you roll 3 dice, then consult the template to see what direction it moves in. If you got 2 hammers and a crit then you can determine in what order to apply them. You pick your first dice, then scatter into the hex indicated by that symbol on the template, then pick the next dice, and scatter that direction from there, and so on until you use up all of the dice. Those are the real only major changes to the core rules of the game. You can watch this pretty cool video with Becca Scott going over the gameplay in more depth. The warbands we get with this box are the Stormsire's Cursebreakers, a trio of Sancrosanct Stormcast led by a Knight Incantor, and the Thorns of the Briar Queen, a bunch of Chainrasps led by a Banshee like character. These are all push fit like we are used to and each come on their own frame. I really like the Knight Incantor model and think it may be the nicest out of the three now available. He's actually got a bit of magical energy playing around his one hand and his pose is super dynamic. A nice bonus of this trio is that it fills out the starter set Evocator unit perfectly. By combining the two Evocators in here with the three from the Soul Wars starter set, you get a full unit for regular games of AoS, plus another Incantor. One of the Evocators is a woman as well, so it gives the unit a bit of diversity. I'm sure there will be a unique warscroll out for these guys as well, as there always is, but it's a nice alternative nonetheless. The Nighthaunt models in here are magnificent. These are some super cool looking Chainrasps, with the leader and the Everhanged being my favorites. The only downside to them is that I did notice that a few of them are exact copies of poses from the normal Chainrasp set but with extra details sculpted on. It would have been nice to get all unique poses, but it's a small complaint. The Briar Queen herself is awesome looking, and I'll definitely be finding a way to include her in my Nighthaunt army. I also really like the color of plastic they went with. Just like all of the other Shadespire warbands, these two come in colored plastic so you can start playing right away. All of the other snap fit Nighthaunt stuff has been a dark blue green colored plastic, which is difficult for me since I spray mine with Corax White. These ones though are a nice pale grey green, so they should paint up nicely. We also have getting started decks for both the Nighthaunt and the Stormcast, as well as a third deck of additional cards. After a look through them there are plenty of good additions, but the main things I was interested in were the spell cards since this is the largest fundamental change to the game. Between the three decks we get there are only a handful of spell cards. Some of these are upgrades and some are gambit cards, as well as some being unique to their faction, while others are generic. The Knight-Incantor also has a spell built into his card, so he always has that one available. I'm sure as the game expands we'll see even more spell cards added, but for right now they seem to be just a little boost, which is good, since we don't want the game becoming suddenly spell-centric. It looks like there is going to be a total of 557 new cards added throughout the life of Nightvault, so there's tons of opportunities for cool cards. I haven't had the chance to get a game in with the new rules and warbands yet, but it looks like the Nighthaunt will be a ton of fun to play. They can move through any impassable, lethal, or occupied hexes, which makes them extremely mobile. They even get inspired by being next to an enemy occupied hex, in true ghost fashion of course. What ghost could pass up the opportunity to haunt someone. They have a few ways to boost their movement through different gambits, and there is an upgrade for the Briar Queen that allows her to essentially attempt to unbind an enemy spell, which is not something you can normally do. One of my favorite cards I noticed is a Nighthaunt ploy that allows you to make an enemy fighter uninspired and makes it so they cannot become inspired again during that game. That can be pretty devastating on the right opponent. There are all of the basic objective cards in here, like Capture Objective 1 and such, which makes me wonder if you can have one of the new versions of that card and one of the old ones in your deck. I know you can't duplicate cards, but they both have different artwork as well as a different number on their side since they come from Shadespire and Nightvault respectively. A small change I noticed on the cards for the warbands is that the little picture of the model in the top corner is now one of the painted model. I understand why they had it be the unpainted model before, but I personally like seeing the nicely painted 'Eavy Metal models. As far as the backstory section goes, we get a brief recap of what's been covered previously, as well as a little bit of progression. The recap is great for new players, as well as for veterans who might not have read it since Shadespire came out a year ago. Since then the Nightvault beneath Shadespire has been opened by Nagash. This is essentially a dungeon area where the Katophranes, in life, kept those who sought to undermine their works or steal their knowledge imprisoned. There were even rumors that strange rituals and experiments were preformed on the captives. 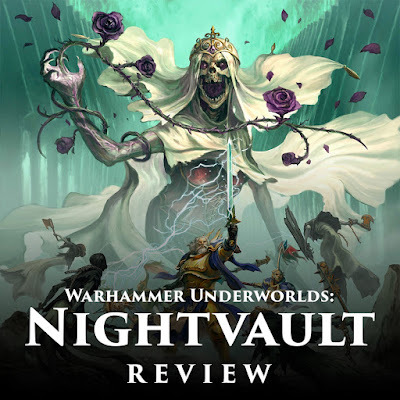 Once the Necroquake rolled out across the realms even hidden Shadespire was affected and Nagash broke the chains holding the Nightvault shut, unleashing the spirits that had been trapped inside for ages. With them he hopes to cleans Shadespire of all of the intruders and reclaim it for himself. It's a nice little twist and helps explain why the Nighthaunt are now present along with the increase in magic. I'll definitely be painting up the Nighthaunt warband, probably with basing to match my army though, and taking them for a spin in Nightvault. I'll have to get their dice and card sleeves as well since I can't resist a good add on like that. Even though the only two major changes to the rules are magic and scatter I think they are substantial enough that it will really shake up how it's played. The new cards are the main addition to the rules, which will be an ongoing evolution. They've also teased the new warbands coming out which look to include some Kharadron (decidedly anti-magic), grots (! ), Tzeentch, and more. I'm very intrigued to see how Tzeentch affects it. right now we only have two level two wizards, but I could see the Tzeentch wizard being level 3, which would definitely give him his rightful dominance at the top of the magical food chain. 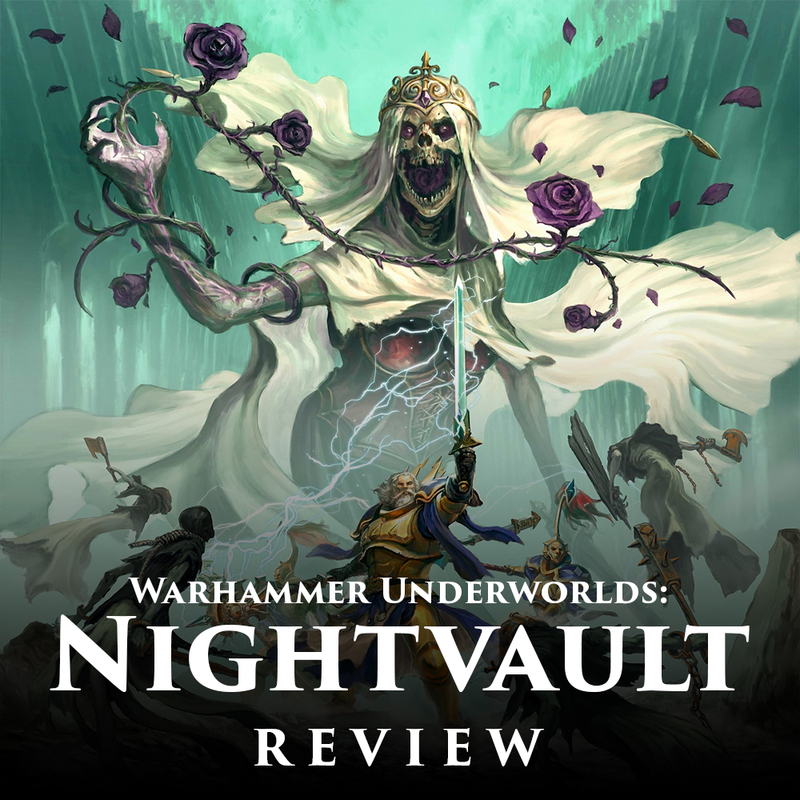 What are you most looking forward to with Nightvault?